Games. They’re fun to play and even more fun to design. In a previous e-learning challenge, we saw some really creative games designed around topics for all ages. Articulate Super Hero Paul Alders recently shared a free math game template. 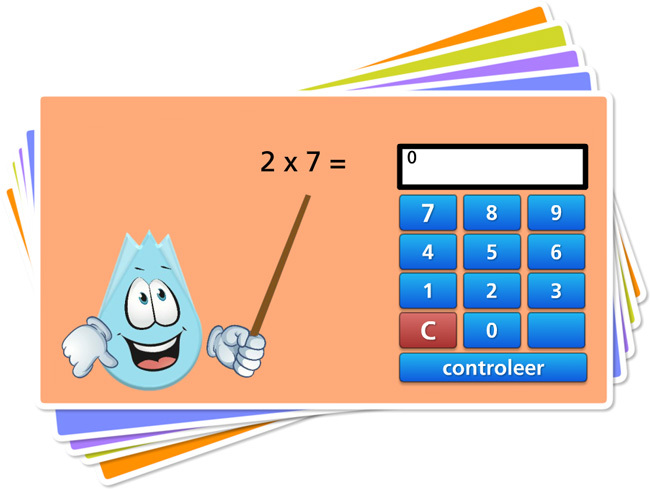 Using a flashcards design, the learner progresses through the cards by correctly answering basic math problems. 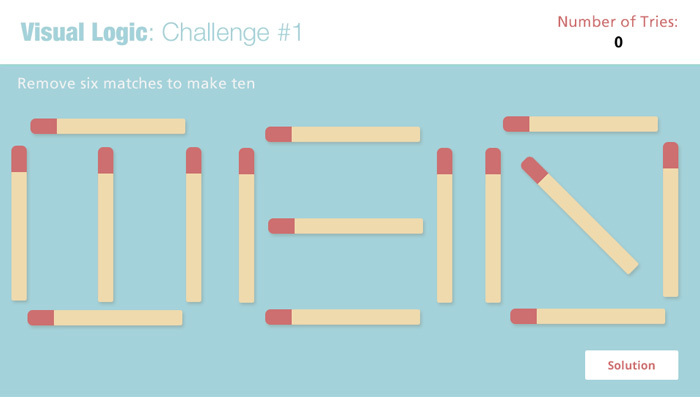 An amusing math game designed by Jeanette Brooks. 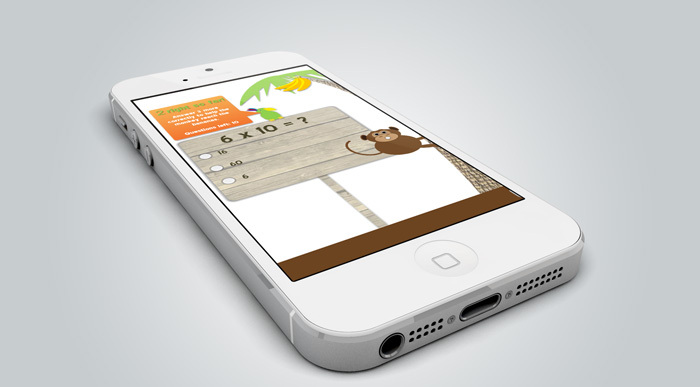 Help the monkey climb the tree and reach the bananas by correctly answering the math problems. Excerpt from learning course designed by Super Hero Phil Mayor. 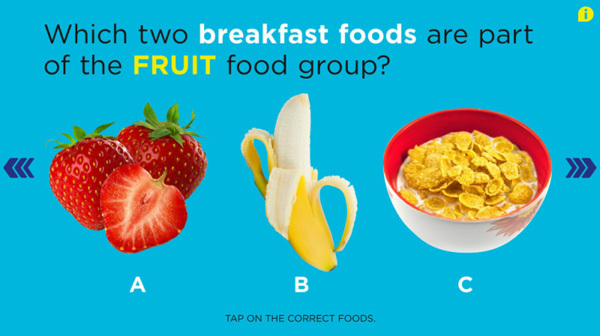 This interaction helps kids learn about healthy food choices. You can design any type of learning game you want. Just keep it simple and have fun with it. 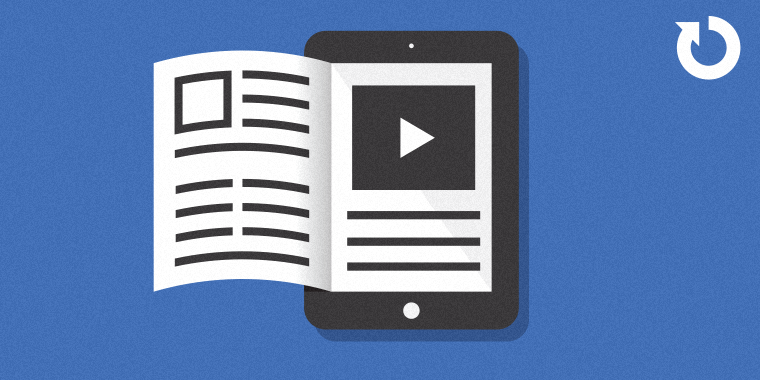 Here are some e-learning game examples shared by your fellow community members. Not all were designed for kids, but there are some free templates that might help you get started. Wishing you a game-tastic week, E-Learning Heroes! The weekly challenges are ongoing opportunities to learn, share, and build your e-learning portfolios. You can jump into any or all of the previous challenges anytime you want. I’ll update the recap posts to include the work you share. This is more a game than something educational unless teaching children to escape is a good idea (perhaps for ninja children that would work). I built this for the original storyline Beta and the rebuilt during the Storyline 2 beta, not many have seen this one http://elearninglaboratory.articulate-online.com/8281404909 The escape may be slightly different to the one your remember. I will build another one specific for this challenge next week. Nice, Phil! I liked that the Mondrian was for more than just show, and that I was steered away from serious injury in room two with your well-worded prompt. :) I think puzzling through something like this is a great exercise. So awesome!! I especially like the use of Beaker. One of my favorites. I the puzzling is awesome. I can't wait to find something I can use puzzling as a game on. Really cool puzzle game! I love games like this with the hints elsewhere in the room. Awesome game play. When I saw this one I got scared because I never did figure out how to unlock the door in the first one you did, but am happy to say that I got this one. I guess I needed one aimed at kids to get it right! Beautiful work as always! Maybe it says something about how my brain works because I could see the pattern in the colours right away, but not with the dots. Now I know why I love those puzzle games so much....I can't quit before solving them. Great work Phil! This challenge is going to be super popular. I can feel it. I'm busy all weekend but I will try to catch up later in the week! hhhmmm... interesting... let's see what I can come up with... time to get "dangerous"
Yet another challenge I could not resist! Here is a mathematics game for children: http://elearningo.com/mathematics-game/ Update: Plays well on Chrome and IE, not Firefox for some strange reason. Howdy Robbie, I liked the game but it kept timing out after two or three clicks. Is that just my suckish internet connection? Hi Kristin, Nope, I think it is Google Drive which is playing up as it is hosted with them. Your internet is not to blame :-) I've just tested now and it seems fine so hopefully it doesn't cause any more issues. Thanks! Update: Only seems to occur in Firefox I've just noticed. Chrome and IE seems fine. Hi Robbie! I'm afraid I'm having the same issue as Kristin. After the first few clicks it just keeps trying to refresh, but won't continue. Nonetheless - looks like a great game! This is great stuff Robbie. Nice work Robbie, I didn't know that there is so much to find on a farm. Luckely I found the right answer. Howdy Tim, I think the timer adds some great motivation. I also love, love, love that there was some randomization with what puzzles you get. Makes it more interesting. This could totally be a kids app. Thanks Kristin! There's a total of 16 different questions, which I randomly pull from. So, each time you play the game it's totally different. This is so beautiful, Tim. Love the approach of using just a hint of a picture as a prompt. I'm looking forward to your blog post to see where you got your inspiration. This would be perfect to post to the Spelling Bee and Interactive Vocabulary Quizzes challenge, by the way. I don't think you've posted an entry for that one yet and it might be really helpful for people searching for ideas on that thread: https://community.articulate.com/articles/spelling-bees-interactive-vocabulary-quizzes Great job! Thanks for the kind words Jackie! I'll take a look at that other challenge too. THANKS! Here is a link to my blog post: http://bit.ly/1BxgjcM. Holly cow Tim! - the design is just beautiful. Thanks Nancy! I really appreciate it! Nice Job Tim. I also liked the approach you took with the pictures! Thanks Jeff! Best of luck with your workshop this week! Awesome work on this one Tim, the approach with the images made it really fun to play. Really lovely (as always) Tim - beautiful and fun! I had a play this afternoon, this is what I came up with http://elearninglaboratory.articulate-online.com/8281452403 I only built out one example as I started to get a little bored, think it needs some sound effects, but this gets the concept of what I wanted to achieve across. On the last bit (the sum), getting it wrong gives you a solution so you may want to get it wrong as well as right. Had some fun, may add some sounds in tomorrow, have a vision for a success page and doing some other bits, perhaps keep those to add in for another time. Great work Phil! I'm loving the flat design! Really nice Phil. I liked the way you introduce pictures as a way to teach quantities and then closed it out with an actual addition problem. Really super cute. I love the colors and the bright, simple design. Really cool Phil, great design too! So now the flat design is everywhere, even in the world of games. Love it! Jeff, the second one I built won't work on a tablet because I used keyboard entry, the first should. Just tried to look at the designs on my iPad but am getting the same cannot connect error as Jeff is getting on Android. I think there might be something wrong with the latest mobile app update. Great stuff, Jackie. I was thinking about something similar but I couldn't suss out a way to simplify it and its too complex right now. I like your approach! Thank you, Kristin! You hit the nail on the head. 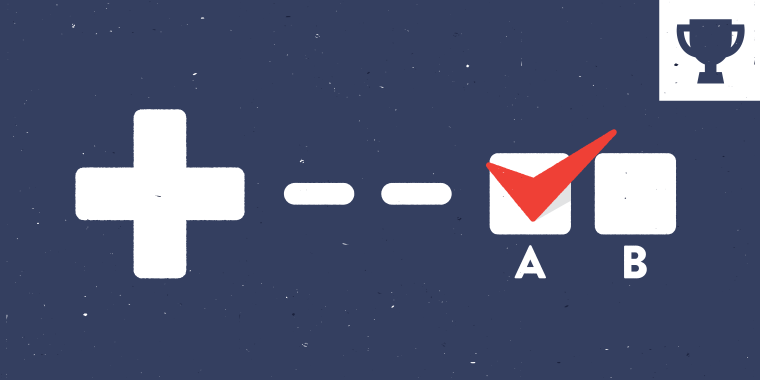 I, too, struggled for a long time trying to come up with an approach that was simple enough to get the idea across, but that wouldn't take forever to design and build. In my blog post I'm mentioning the other things I wanted to add. That'll have to satisfy me for now. :) I'm looking forward to seeing your game, too! Thanks, Robbie! I really appreciate it. :) I know - even though those cupcakes probably taste like the PNGs they are, they look pretty tasty. Nice one Jackie, loved it and so did my six year old. Simplifying is the problem, I had so many ideas that I may keep and add for a Guru entry if we get one. Thank you, Phil - and good thinking keeping a six-year-old on hand to help with game testing! (Why didn't I think of that??) I'm glad you both liked it. :) Simplifying is definitely the problem! Yes, if they go with the Gurus again it'll be a great opportunity to work on more elaborate ideas. Great job Jackie, It's a nice game to teach children the value of money. Actually, for quite some time, I walk around with the same idea of setting up a kind of money game to teach childeren the value of money. Thank you, Paul! Yes, it's a topic that's easy to get creative with. Hope you get a chance to do one eventually! That's funny, Linda. :) On the bright side your option is sooooooooooooo much better for you!! Very well done on this one. I like the work with the sounds and contrast images. I also really liked the game, Ridvan. I really liked that you incorporated an example at the beginning that took the place of a long page of text instructions. Well done! Great one Ridvan! I love the colors, the font and the sounds! That was fun Ridvan, well done. Hi Alexander, all of those things are supposed to happen! It's to help with motor skills. The negative points come in when you click the hint button. The trowel has to be put back where you found it before you can plant the seeds. I'll put a trowel outline there so it is inferred more. I used to work at a pre-school and fine motor skills was a big topic. Drag and drop games can help a little with fine motor skills but obv. not as much as a child playing with an actual object. Anything that requires precision when moving can help a bit. I designed mine to be played with a child and parent/teacher/caretaker. I'm going to do a write up on it. Thanks for the clarification Melissa, it makes sense to me now. I can see where having an adult with the child will help them overcome this obstacle. Just to help you out for future versions of this game (which I really love for the design and feel of it) when I saw the prompt to plant the seeds, I immediately went for the trowel to dig some dirt up. I was envisioning the scenario playing out this way where I would then drag and drop the seeds into the hole I dug and then use the trowel again to cover them up. I look forward to the update with the outline and thanks for addressing my issue. I can definitely add that in easily. Liked the game, Melissa! I did a lot of *ahem* "research" on kids game apps and one of the things I noticed right off the bat with the preschool games was that there was little to no text and a lot of simple voice instruction and repetition of that instruction. I see that you implemented some of those concepts. I'm going to add more tip bubbles. My boyfriend played it and he couldn't figure out that he had to dig a hole for the seed LOL. Great work Melissa, I was waiting for Mario to appear! Good one Alexander, that was fun! That was a cool context, Alexander. I like how the horse was doing all the work! LOL Kristin! Yeah, I had a few Mountain Dews playing with the state changes on the horse. Thank you Jackie! This was on SL1, imagine how great it would look with motion paths in SL2!!!! Can't wait to get it (just need the money). Nice work, I enjoyed the intro and the Saloon background music. I did feel sorry for the horse when I failed the game! Thank you Gerard, the music was extracted from PowerPoint. I had a ton of fun with the horse's reactions to the bombs. I figured it would give the kids something to laugh at in the face of failure. Ahhh...done at last! :) Here's my blog post about this week's entry: http://www.jackievannice.com/?p=175067017 And here's the demo: http://www.jackievannice.com/challenge_59_yummy/story.html I'm looking forward to seeing all the new games we'll be getting this week! Hi Jackie, lovely design and interaction. Perhaps, in the second version of this game we could tag some variables to add\subtract the value of the cupcakes from the dollar bill. What do you think? Aahhhh, it all came clear by reading the post! Thank you! Sweet approach Matthew, I love it. Nice, Matt! I'd never heard the phrase "musty hives" before, but now that I've learned it I plan to use it again soon. I'll bet that was a variables workout! I've not created this style of game yet, but I'd like to. Great job! Lol! Thanks Jackie. I hadn't heard of it either :-) I wanted to use something a bit fun when a pair was matched so I googled 'bingo calls' and I used the ones for 11, 22, 33 etc. I hadn't done something like this before either with lots of variables and heaps of triggers! It was a good learning experience. Well you pulled it off like a champ, Matt. Genius source for your feedback phrases!!! I'd never have thought of that in a million. Great job Matt. Reminds me of the game I was always bad at as a child. In fact, I still think I can't beat a 5 year old on this game :P Re variables - I am sure you had a ton to insert! Good font choice for the game Matt, nice and clean. Your eyes must of got quite blurry with the amount of variables and triggers used to make that game! Great submission Matthew, that must have used a lot of variables. Really good-looking game, Clara! I love all of the contextual help: the list, the money decreasing, and the help text. It would be really awesome money management portion in a game where users went on to actually cook a dish! Well done! Very interesting solution. Children will be delighted playing and learning about the value of money.!!! Beautiful game, tons of potential as a starting platform! Muy bonito el diseño! Veo que hay buena oportunidad para adherirle una caja de dinero que descuente de una figura nominal. Que les parece? Hola Alexander, muchas gracias por tu sugerencia. En realidad, esta actividad forma parte de un juego más complejo, dedicado a la reflexión sobre violencia en el ámbito familiar. That's really interesting... So this game is part of a more complex module about domestic violence? How is it connected? Muy interesante... yo estoy creando un modulo acerca de la cultura en sectores de pobreza. Como se conecta este juego a la violencia domestica? Thanks for your comments. I am very happy to participate in this beautiful initiative. Actually this test is part of a much more complex game I'm working on, which allows children to learn and apply behaviors that promote coexistence nonviolent in their home. The idea is to collaborate with simple household tasks, with the representation of their families, which they can choose, as well as their physical appearance. I am still working on it. I hope to show more of this work. Great !!!! Excellent job. I want to see more examples like this. Congrats. Funny enough, I have two "games" I developed in Storyline that I can share. I developed a set of 1st Grade Math Flash Cards to help make math fun for my daughter. This one uses a LOT of question banks along with one final result slide that pulls in the scores for all the sets of numbers attempted. https://dl.dropboxusercontent.com/u/122411650/1st%20Grade%20Math%20Flash%20Cards%20output/story.html A couple of years ago I also created a trivia game they used in my son's classroom as an activity for their winter celebration. Nothing fancy in this one, just a lot of customized feeback for the questions. The kids split into several teams to answer the questions, but it could also be done individually. https://dl.dropboxusercontent.com/u/122411650/Winter%20Trivia%202012%20output/story.html Have fun! Awesome game, you have saved me a ton of time as I was getting ready to develop a game like this for my kids to practice their math. Thank you! Enjoyed your maths game Diana. The graphics are very neat, and I like how you have provided the learner the choices, rather than being just linear. Awesome! Wow! Really complete example. A great portfolio piece for sure. I like that there is a timer to add to the challenge. Great work Dianna! I also liked how you can choose what you want to practice. Here is my challenge for the week. http://bit.ly/1u3nwY8 Practice counting change with Canadian money. Hi Cary, magnificent use of the a-bot-tar! The interaction is super engaging. Woo-hoo! I am a master at counting change! I just knew I could do it. :) Nice one, Cary! Nice work Cary, I have a question, How you used all screen with out a player ?? Thanks. To hide the player go to the player screen and uncheck "Resources", "Notes", "Menu", "Title", and "Volume". On the Colors & Effects page click on the "Show advanced color editing". Change all of the base colors (>>bg, >>menu_shade, >>slide_bg, etc.) to 100% transparency. Well done Cary, can I give you my pennies? Cause no one else will take them! Here is my submission for the week! Who Stole My Guitar? A Math Mystery http://tinyurl.com/ox3zcbm Now, it's time to see what you guys have been up to! Lots of fun and very engaging due to the mystery. Top stuff Richard, loved it! I like the clean interface Richard. The navigation was intuitive and I liked the investigative approach. Great game, Richard. I loved the mystery aspect. Simple but engaging! Beautifully done, Justine! I especially like the visual design and LOVE the planet drag and drop! Congrats on (what I think must be?) your very first challenge! Justine, that was so much fun! You did a wonderful job and the design was really great! That was awesome Justine! Thnx for sharing! Great entry, Justine! I'm sure glad I was able to keep trying on the drag and drop! 6 out of 8, there goes my career as an astronaut! Digging the comic book style and the interactions, Paul. But I have to admit that I am failing miserably to find this notebook! Great work Paul, I also really liked the comic book style and the challenge of it! I had a lot of fun finding the final words in the notebook :) Great example. Great Paul. The scenario and finding the final word are creative. I love all of the examples I have seen so far! I've been so busy but I am definitely going to check them all out in the recap. Loved the texture and images on the game. Really created a cohesive context. Nicely done. Really nice Joanna, short but sweet! Its great Joanna. combining learning and saving the nature. I have a fun game that I would like to share. However the tutorials that I have found on sharing using Dropbox and Google drive unfortunately are not work for me. Any ideas on how to host and share my contribution? Hi Jonathon, I can see how Google's new interface might make this a little more daunting. However, I was able to post the game through my Google Drive. https://48ed55d9748cbbbb047d46071684c9459abab315.googledrive.com/host/0B0sK4-BPFjirNmxrQlU5YnFCeWM/story.html Short of having your own website, this is a great alternative. 1.You have to copy your output folder to Google Drive and make it available to the public. Right-click folder>Share>Advance>Public>done 2.Then open the folder and copy the URL code behind "#folders" 3. Then share your link as you see above with that code after "host/" and pointing to story.html Now you try! GOOD LUCK!